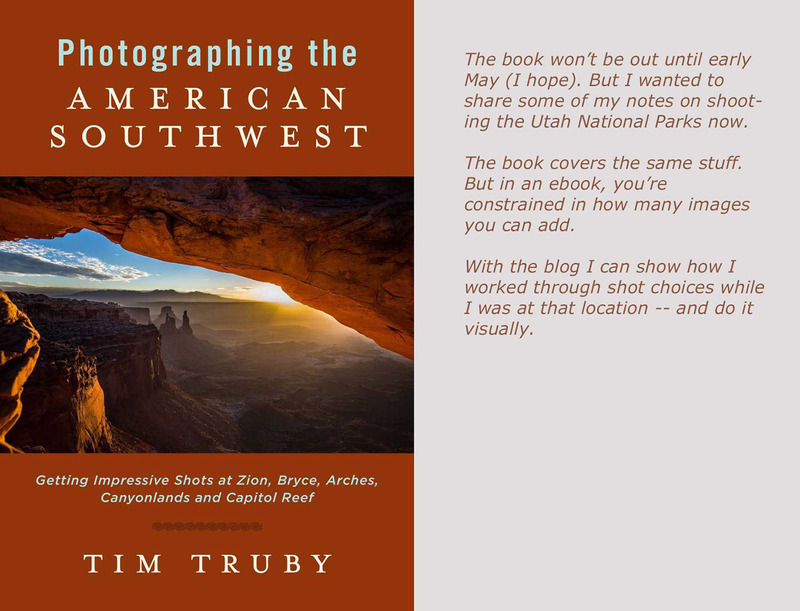 While preparing the Utah parks book, I discovered all kinds of photo locations that are a bit off the radar screen. This spot didn’t make it into the book because I try to focus that project on photo locations that aren’t hard for the photographer to get to on their own. And this spot requires a bit of travel on a 4-wheel vehicle, it’s on BLM land. Just for reference, Utah Route 9 runs along that plateau and adjacent to those low peaks on the far side of the valley. So Hurricane, Utah, is in the area off to the far left. 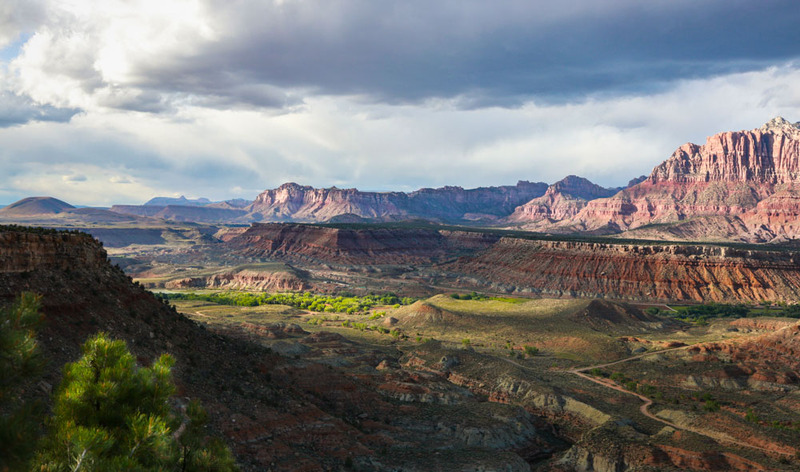 This shot was taken in the hills just east of Springdale, Utah. From Route 9 heading towards Zion, you take one of the roads off to the left and head up and past a residential area. Those of you who’ve been to the Zion Valley may recognize the view. These peaks are what someone at Court of the Patriarchs would see on the west side of the Valley. Shooting Zion can be a challenge, especially the contrast issues with the bright canyons and the shade. It’s tough for an outsider to know where the light will be good and when. I can be precise as to where to be and when to shoot – the time of day, the right season. Another thing is, Zion is getting a world-wide reputation. 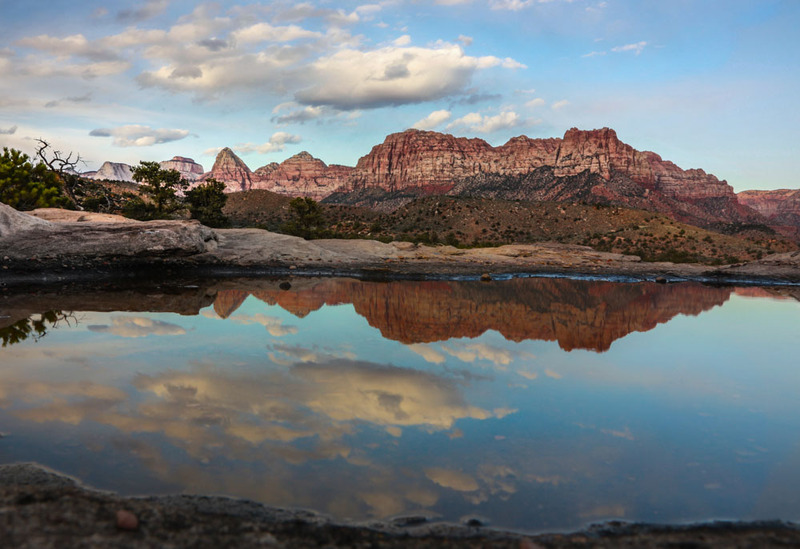 So pros and advanced camera folks have Zion images in their portfolios. That means a lot of locations are overdone. And as the local pro, I know some obscure areas, locations with great scenery that no one else is shooting. And having a quiet place to shoot gives the photographer an intimacy that changes the quality of an image. After all, photographers want that emotional connection to a spot. And that’s easier when you’re alone and not stacked up next to 5 other tripods. Seth and I also did a day-long photo session in The Narrows. And having someone along who knows where the best light is for that time of year was a huge help. His experience meant I just needed to focus on getting the shots I wanted.